Snowpack on an incline is in a constant tug-of-war between stress and strength. Gravity is a stress that increases with slope angle, and the snowpack has its own ever-changing strength. When the strength is greater than the stress, snow stays put; but when the cumulative stress is greater than the strength, something’s gotta give. Picture an old-time circus with a flexing strongman. If someone hands him one bag of snow at a time, he can adjust to each one, ultimately supporting an impressive weight. At some point, however, he simply can’t take one more bag and collapses. The strongman in this scenario is the snowpack; the bags of snow are the stress. Now picture that same strongman without time to adjust to each added weight because a bunch of bags (new snowfall) are loaded onto his shoulders over a short period of time. Without the opportunity to adjust slowly to the new weight, he collapses immediately. As an avalanche moves, it displaces the air in front of it. If the slide is large enough, this can create a forceful air pressure wave. The uppermost boundary of the slide that runs perpendicular to the slope. Avalanches are categorized in two general ways: loose or slab. In loose slides, the snow has little or no cohesion, and a single release point near the surface causes the avalanche to fan out in the shape of a triangle. Slabs, on the other hand, are a cohesive mass that releases along a failure line, sometimes as deep as ground level, and cut an irregular square or rectangular formation. 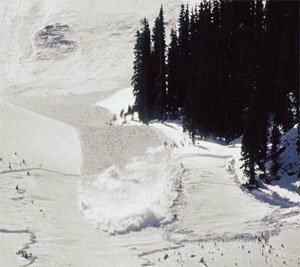 Slab avalanches are the most dangerous and destructive. Every granular material has a different angle of repose. For snow, it’s 38 degrees, but avalanches can occur on gentler slopes, depending upon the snowpack’s composition and other factors. Some avalanches have been recorded to run at speeds in excess of 200 mph, but the average speed of a slide is usually 60 to 80 mph. The power of an avalanche can be enough to snap mature trees like toothpicks and even destroy reinforced concrete structures or flatten small villages. The area from which an avalanche typically initiates. The side boundaries of the slide. The surface upon which the snow slides, such as the ground or a snow layer (for example, sun crust). The bottommost boundary of a slide, which is usually buried by debris. Because our local snowpack basks in copious winter sunshine, lies at a fairly low latitude on steep mountains at high elevations, experiences drastic daily swings in temperature, and collects relatively little snowfall, it is infamous for being especially difficult to predict and prone to avalanche. When snow moves at tremendous speeds, friction causes it to warm. After an avalanches comes to rest, the snow cools quickly and settles into a dense and compact debris. There’s little air for buried victims to breathe, and rescuers have to be quick to respond, good with their rescue equipment and determined when digging. Successful rescues are usually completed in less than 15 minutes. The leading edge of the moving snow as it slides. The place where the avalanche debris comes to a stop. The area in which an avalanche runs. This snowflake has become angular, and grains like this will continue to grow in size in the lower layers of a snowpack, called “depth hoar.” Its angular edges don’t bond well with neighboring grains, and this layer often becomes the primary weakness in a snowpack (particularly in the San Juan Mountains). Neither rounded nor angular grains are a problem by themselves, but a cohesive mass of rounded grains (a slab) on top of a weak layer (such as depth hoar) is akin to a sheet of plywood on marbles. Avalanche conditions may be safe one day and entirely different the next—even without overnight snowfall. Temperature fluctuations and wind, which scours snow from one place and loads it up in another, affect each day’s conditions. Track: The area in which an avalanche runs. Runout: The place where the avalanche debris comes to a stop. Powder cloud: The leading edge of the moving snow as it slides. To check daily avalanche and mountain weather conditions throughout the state, visit www.avalanche.state.co.us. Online, the “Northern San Juan Zone” is specific to Telluride. 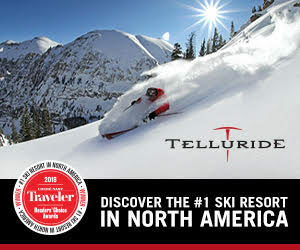 Avalanche courses are offered regularly in Telluride and other mountain communities.